Aside from the story, the artistic style and cinematography, songs; and new guns and modes of transportation, characters are the reason why Borderlands players are hyped up. They are thinking who among the characters of the previous version of Borderlands will be returning as well as the new characters’ (and their powers) role to spice up the thrilling games’ story. Below are the list of the possible returning characters and the new ones. As shown on the trailer, Borderlands 3 looks like a celebration of the Borderlands. It’s filled with returning faces that were remarkable and well-loved by players. There returning characters include the Vault Hunters like Lilith, Maya, Brick, Mordecai, and Zero. Rhys, from the Tales of the Borderlands, is now sporting a mustache and funny jacket and currently hanging out with the latter. Tina, Marcus, Ellie, Sir Hammerlock, Claptrap, and other few old enemies are making their comeback as well. According to Pitchford, Moxxi is also returning and will play a big role. 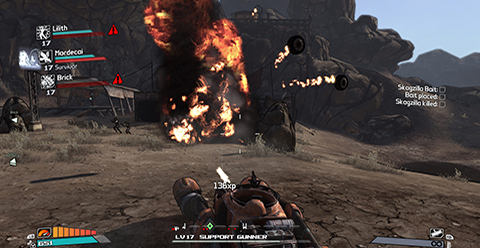 Upon the release of Borderlands 2, most of the characters from the first installment were called up. So, this will also be the same scenario for the third installment because the Gearbox (the creator) is trying to conceptualize a big series climax which involves the characters from previous versions. A good game will not be possible without the villains who add up the thrill on the game. Well, like other versions, plenty of people, aliens and robots will challenge our characters to unleash their power. However, it looks like the Calypso Twins are going to be the biggest antagonists of this installment. We have seen their potential powers through the released trailer and also confirmed that they are powerful. They are the meanest of the villains which are impossible to defeat. Through the trailer, we have seen Lilith as she was crawling towards something and looking defeated. Her tattoos vanished and it looks like it was absorbed or taken away by the bad guys. Moreover, there are lots of Sirens popping throughout the trailer (which includes Lilith and her tattoos). It only means there will be plenty of scenarios where these are being sucked out. Surely, these events are linked to the twins, whose role is to absorb other character’s fancy powers. Another hint from the trailer shows the Calypso twins were joined by an army of monsters, mechs, psychos, and mutants which supports the idea of defeating all the Vault Hunters. There are also fire-breathing dinosaurs, returning pests and armored heavies which shows up to burn the skies and spread darkness. On previous versions, Borderlands stuck in Pandora and the farthest the characters have been was the Pandora’s moon. This time, the game would venture one corporate-looking metropolis and damp looking swamp world. Pandora will still be a significant place but based on the trailer, the awful corporation in the Metropolis, Atlas will surely take a big role in the gameplay. It looks like Borderlands 3 will be exciting based on the characters, villains, and setting. It’s a new expanding journey in the Borderland which will test the ability of the characters and the players.